The local musicians segment of episode 9 of myrtle beach TV features the talented, percussion-driven group Ten Toes Up performing live at the Hot Fish Club in Murrells Inlet. Chris Ward also interviews the band to let our viewers learn a little more about this unique group of musicians. The giving back segment segment of this episode has Warren talking with Michelle LoPinto about the animals available for adoption at the North Myrtle Beach Humane Society, and the upcoming Duck Race in September. Charlene Lynam, events director of the North Myrtle Beach Chamber of Commerce, tells viewers about the upcoming Endless Summer Festival; Mary Martin, Executive Director of the Little River Chamber of Commerce talks about the growing chamber and town of Little River, as well as her leadership role in the Rotary; and more. First aired on Sunday, FOX July 29, 2007, episode 9 can now be viewed online in its original HD format. 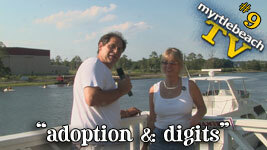 Watch the Windows Media HD version of the "adoption & digits" show online.